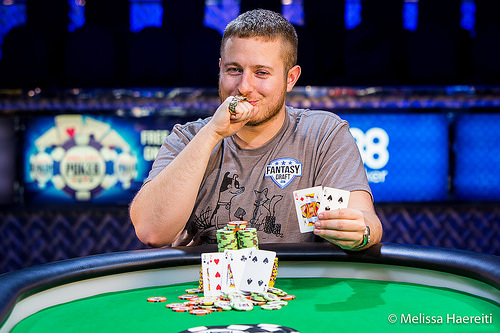 Brian Hastings is the latest winner player to win a gold bracelet at the 2015 World Series of Poker. This marks his second victory of the summer and third career win overall. 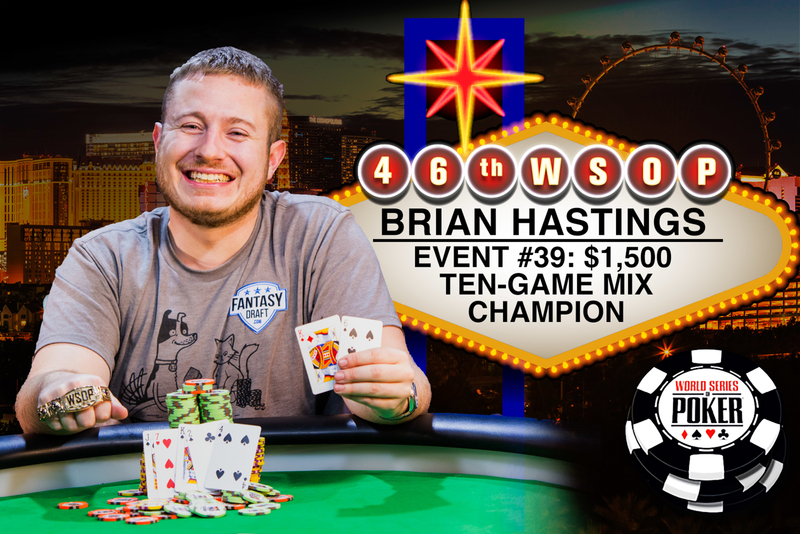 Just ten days after his triumph in the $10,000 buy-in Seven-Card Stud Championship (Event #27), Hastings returned to the same stage and seat where he won previously. Hastings’ first WSOP occurred back in 2012 in the $10,000 buy-in Heads-Up No-Limit Hold’em Championship. However, for all those who saw this victory, what is likely to stand out and be remembered was Hasting’s confident demeanor throughout play. From the smiles on his face to the laugher he shared with his supporters, even when behind in chips, it was as though Hastings knew he was going to win. The high-stakes poker pro from the Philadelphia area topped a 380-player field in the $1,500 buy-in Ten-Game Mix (Six-Handed) championship, which was played over a three-day period at the Rio in Las Vegas. The victory was made even sweeter by staging a significant comeback during the tournament’s final stages, during which his last human obstacle, a tough Ukrainian-born poker player named Rostislav Tsodikov, enjoyed a 4 to 1 chip advantage at one point early in the match. However, Hastings never gave in and patiently waited for moments to push his stack, which ended up reversing what some thought might be Tsodikov’s first major victory. In fact, the final duel was a brutal back-and-forth battle of swings, which lasted nearly three hours. However, Hastings never seemed in danger of going bust, despite being at a disadvantage during almost half of the duel. Hastings thought the difference might have been his mastery of all games, whereas he sensed his opponents had certain weaknesses. Indeed, Hastings enters the next Mixed-Game format as one of the favorites. One of poker’s most prestigious poker events of the year, the annual Poker Players Championship is scheduled to begin just 14 hours after Hastings won this victory. This tournament was completed on a Saturday night on the ESPN Main Stage in front of a large group of spectators and large viewing audience watching the live stream on WSOP.com, largely attracted by a star-lineup and interesting format of games. Most of the modest-sized field was eliminated on Thursday, during Day One. Once the prize money was reached during the middle of Day Two on Friday, the pace of play slowed down considerably as the 42 in-the-money finishers jockeyed for position down the homestretch hoping to reach the final table. Among those who cashed, but fell short of the finale were gold bracelet winners Daniel Negreanu (41st), Young Phan (35th), Max Pescatori (32nd), Jeffrey Lisandro (26th), Eli Elezra (24th), Phil Hellmuth (17th), Dan Kelly (15th), and Ylon Schwartz (13th). Other notable players who ran deep in this event but missed the feature table included Bruno Fitoussi (12th) and Matt Glantz (10th). Of special note was Phil Hellmuth’s third cash this year, which was the 111th cash of his illustrious career, the most of any player in WSOP history. Mixed-game formats have become increasingly popular attractions in recent years at the WSOP. No less than eight events on this year’s schedule include multiple games. Seven events require participants play 5 games or more, with two “Dealers Choice” events serving as the supreme test of variety and adaptability (up to 18 games spread). Ten-Game Mix (Six-Handed) was first offered at the WSOP in 2011. Chris Lee was the debut winner that year. Since then, it’s been a staple game on the schedule, usually attracting veteran players who play multiple games quite well. As expected, the final table included a blistering lineup of veterans, with a few lesser known players sprinkled in. 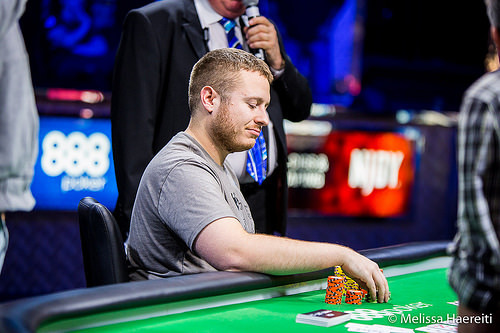 Best known among the final seven players were Hastings, Todd Brunson, and Owais Ahmed, all former bracelet winners. Brunson last won at the WSOP ten years ago. Hastings won ten days ago. And Owais won his WSOP title back in 2011. Ahmed hit the rail first, finishing 7th. Brunson lasted considerably longer, going out in 3rd place after holding onto the chip lead for a bit. Hasting’s share of the $513,000 prize pool came to $133,403, one of the lesser top prizes of this year’s tournament. But that didn’t dampen the intensity of competition or the enthusiasm of the winner. Hastings now believes he can become the fifth player in history to win three gold bracelets within a single year (the others were Puggy Pearson, Phil Hellmuth, Ted Forrest, and Phil Ivey). Having a double-winner this year also keeps a surprising streak alive, which is the 14-year run the WSOP has had a winner of two or more gold bracelets within the same year. Hastings is the first multi-winner of 2015, although others have come close. Tsodikov, the runner up, now resides in Daly City, CA. He’s now cashed 8 times at the WSOP. Up to this point, his highest previous finish had been a 7th-place showing in a HORSE event back in 2007. Hastings is primed to shatter some records given the number of events still to play on the schedule, with nearly half of the events still to come (plus ten events at 2015 WSOP-Europe held in Berlin, Germany). Given how well he’s playing at the moment, and so many Mixed-Game events coming up, Hastings could be on pace to establish some staggering results. When asked about what changes he’s made in 2015 versus previous years that has him playing at the top of his game, Hastings thought having his girlfriend Sonya with him in Las Vegas gave his life more balance. She is a poker dealer at Best Bet Casino in Jacksonville, Florida and has been flying back and forth to work and watch Hastings play. Now, Hastings insists Sonya will stay by his side. This marked Hasting’s fifth cash of the year, his third final table appearance, and second win. He’s now likely to be one of the players to catch atop the leaderboard in the WSOP “Player of the Year” race, as the contest continues to build excitement. Second Place: Rostislav Tsodikov played arguably the best poker of his life and just happened to run into a buzz saw of an opponent who playing as well as anyone in the world at the moment. Tsodikov held the chip lead during significant parts of the finale, but was never quite able to put Hastings away. The Ukrainian-American collected $82,398. Third Place: Todd Brunson was born to be a poker player. He’s been one of Las Vegas’ top earners in high-stakes cash games on The Strip for years. However, Brunson has won just one time at the WSOP, which came exactly ten years ago to the day when he won a gold bracelet in the Omaha High-Low Split event. He’s made 7 final table appearances since then, finishing 2nd twice. He now has two 3rd-place finishes, as well. Of Brunson, winner Hastings said, “There’s no doubt Todd is a great player, one of the best, especially in the Limit games. But I thought the difference was I had an advantage against him in the No-Limit games.” $52,977 for 3rd place won’t make a huge difference in Todd Brunson’s life, but he’ll be eager to get back to the Main Stage and hopefully reverse the outcome and get what seems to be a long overdue second gold bracelet.Fourth Place: Alexey Makarov, from Russia took 4th place. This was his fifth career cash, which paid $35,130. Fifth Place: Tim Reusch, frpom Hamburg, Germany took 5th place. This was the second cash of the series for Reusch, which paid $23,982. Sixth Place: Mike Watson, from Toronto, Ontario (Canada) ended up in 6th place. This was his fifth time to cash at this year’s series and 36th in-the-money finish for his career at the WSOP. Sixth place paid out $16,846. Special Note – this was Watson’s third final table appearance of the summer, with 7th, 7th, and now a 6th.Seventh Place: Owais Ahmed, from Anaheim, CA rounded out the final table as the 7th-palce finisher. He collected $12,163. Ahmed won his gold bracelet in a Mixed format, playing two split games – Omaha and Stud. Aside from the final table finishers, other notable gold bracelet winning players who cashed included – Daniel Negreanu (41st), Young Phan (35th), Max Pescatori (32nd), Jeffrey Lisandro (26th), Eli Elezra (24th), Phil Hellmuth (17th), Dan Kelly (15th), and Ylon Schwartz (13th). Hastings with this victory, joins some of his widely-respected peers who have garnered additional titles at this year’s series. Among those who are multi-gold bracelet winners adding to their jewelry collection in 2015 have been Robert Mizrachi, Max Pescatori, John Gale, Phil Hellmuth, Tuan Le, Keith Lehr, Daniel Alaei, Andre Boyer, Phil Galfond, Jason Mercier, Jeff Madsen, and Dan Idema. That’s 12 out of 38 completed events, to date. This was Phil Hellmuth’s third cash this year, which was the 111th cash of his career, the most of any player in WSOP history. Congratulations to Brian Hastings, Winner of Event #39: $1,500 Ten-Game Mix ($133,403)! Brian Hastings raises the button 120,000 and Rostislav Tsodikov three-bets to 180,000 from the big blind. Hastings clicks it back to 240,000 and Tsodikov calls all-in. With Tsodikov again in the lead, the flop however gave Hastings the advantage as the lands on the turn. With Tsodikov needing to catch only an ace to stay alive, the completes the board on the river and Tsodikov is eliminated in 2nd place for a $82,398 payday. Congratulations to Brian Hastings on capturing his third career WSOP bracelet and second of the 2015 WSOP following his victory in Event #27 to take his WSOP winnings over the $1.25 million mark. Hastings now joins an elusive club of poker players that include Barry Greenstein, Sammy Farha, Michael Mizrachi, Robert Mizrachi, Antonio Esfandiari, Vanessa Selbst, Dutch Boyd, John Hennigan, George Danzer and Jason Mercier as players possessing three WSOP bracelets. From the button, Brian Hastings raises all-in and Rostislav Tsodikov calls all-in for his last 143,000. The board runs out and Tsodikov doubles through once again. From the button Rostislav Tsodikov moves all in for 63,000 and Brian Hastings calls. The board runs out and Tsodikov doubles through. Brian Hastings has the bring-in and Rostislav Tsodikov completes with Hastings calling and then betting fourth, fifth, sixth and seventh street with Tsodikov calling him down. Hastings tables his for aces-full to motor his stack up to 2,775,000 while Tsodikov is left crippled on 75,000. Brian Hastings has the bring-in and Rostislav Tsodikov completes before Hastings raises to 100,000. Tsodikov calls and both players check fourth street before Hastings bets fifth and sixth with Tsodikov calling him down. Both players check seventh street and Hastings tables his which is good once Tsodikov mucks his hand. Brian Hastings raises to 100,000 and Rostislav Tsodikov three-bets to 150,000. Hastings calls, and when the flop falls he calls a bet of 50,000. The turn lands the and Tsodikov bets out 100,000 with Hastings calling as the completes the board on the river. Tsodikov checks, Hastings bets 100,000 and Tsodikov folds. Brian Hastings raises to 55,000 from the button and Rostislav Tsodkiov three-bets to 225,000 from the big blind and Hastings folds. Rostislav Tsodikov raises to 77,000 from the button and Brian Hastings calls and draws one as Tsodikov stands pat. Hastings leads out for 150,000 and Tsodikov folds. Brian Hastings raises to 100,000 and Rostislav Tsodikov three-bets to 150,000 with Hastings calling and drawing two as Tsodikov stands pat. Tsodikov bets, Hastings calls and draws two again before Tsodikov stands pat and bets out. Hastings calls and draws two, Tsodikov stands pat and bets and Hastings folds. 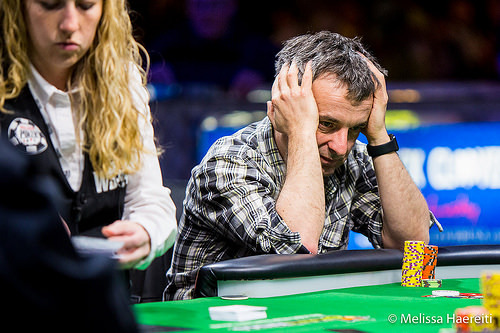 Rostislav Tsodikov raises to 100,000 and Brian Hastings calls from the big blind and check-calls a bet on the flop. Both players check the on the turn before Tsodikov bets the on the river and Hastings calls. Tsodikov tables his for a flush and Hastings mucks. Brian Hastings raises to 55,000 from the button and Rostislav Tsodikov calls in the big blind and checks the flop. Hastings bets out 50,000 and Tsodikov calls before check-folding to a 115,000-chip bet when the turn lands the . Rositslav Tsodikov raises to 100,000 from the button and Brian Hastings calls and draws three to Tsodikov's one. Hastings checks, Tsodikov bets and Hastings calls before he draws one and Tsodikov stands pat and bets out again following a Hastings check. Again, Hastings makes the call but now stands pat before Tsodikov breaks and draws one and the action is checked through. Hastings tables his and scoops the pot. From the button Rostislav Tsodikov raises to 100,000 and Brian Hastings calls and bets the flop. 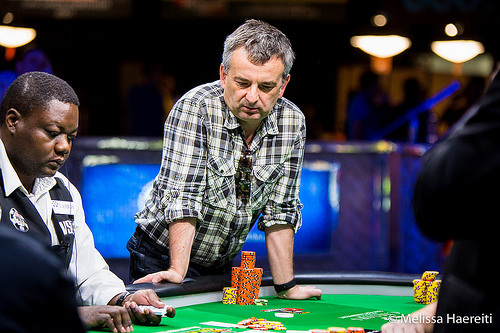 Tsodikov raises to 100,00 and Hastings calls before he checks the on the turn. Tsodikov bets 100,000 and Hastings calls before check-calling 100,000 when the river lands the . Tsodikov tables his for a full house and climbs to 1.65 million as Hastings slips to 1.2 million. Brian Hastings raises to 100,000 from the button and Rostislav Tsodikov calls from the big blind and check-calls on a flop before both players check the on the turn. The river lands the and Tsodikov bets out 100,000 and Hastings folds. Brian Hastings raises to 100,000 from the button and Rostislav Tsodikov calls from the big blind as the dealer drops a flop. Hastings bets, Tsodikov check-calls as the is checked through on the turn. The river lands the and Tsodikov bets out with Hastings making the call and tabling his to prompt a muck from Tsodikov. Brian Hastings raises and Rositslav Tsodikov calls and draws one as Hastings draws three. Tsodikov bets and Hastings calls and draws two as Tsodikov draws one. Tsodikov bets and Hastings folds. Rostislav Tsodikov raises his button and Brian Hastings calls to see a flop. Hastings bets and Tsodikov calls before that action is repeated when the turn lands the . The river falls the and Hastings bets out 100,000 but Tsodikov folds.